This Jotter Pad comes with a heavy cardboard?cover made from recycled paper, the colour?stripe is made from recyclable non-woven?material and has 70 pages of recycled lined?paper. 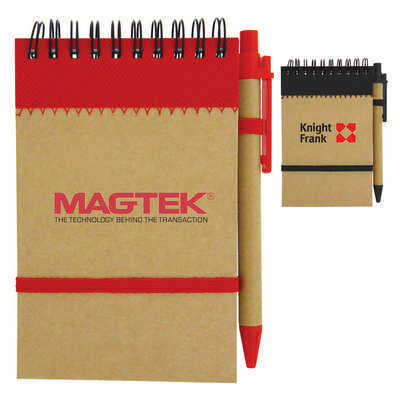 Other features include a blank black ink?pen made from recycled paper, an elastic band?to keep the notebook closed and a metal ring?binding. The back cover and each page feature?the recycled logo. Colours: Red, Blue or Black, Dimension: 90mm w x 140mm h. Price includes : 3 Day Service* Pad Print - One Colour/Location. Setup is included.